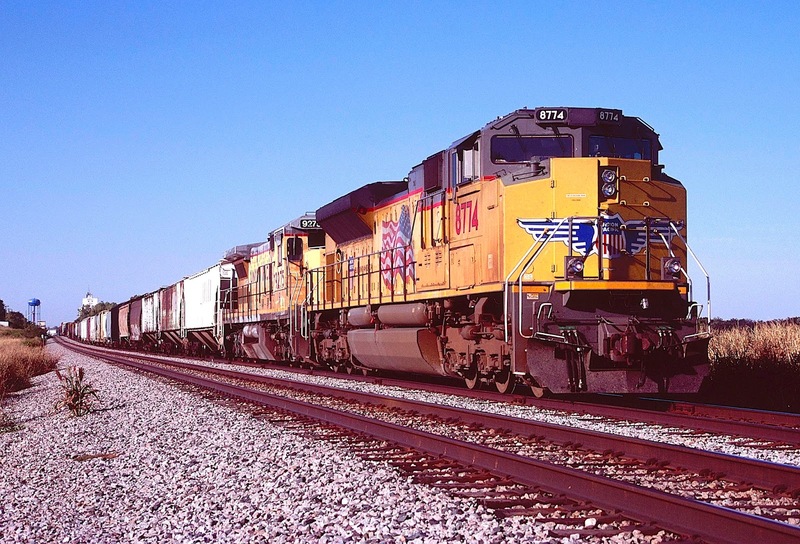 I originally intended this post to contain a brief discussion of the cattle drives on the Chisholm Trail through west-central Oklahoma, interspersed with photographs of the former Rock Island and now Union Pacific line that follows that old route. As I began writing, however, the text kept expanding like a mouse on steroids. Soon it was as big as a tom cat. The writing caused me to realize that life in my home state has been shaped by four enduring events that, to this day, stir imagination, passion and indignation. One, but only one, were the cattle drives. But I cannot explain the cattle drives without discussing the other three events, because their threads won’t unravel. Each makes sense only in relation to the others. I discovered that the state in which I was born and raised is like an outcropping of sandstone in a deep railroad cut. The sandstone rests on silt, which rests on rhyolite, which rests on a deeper layer of sandstone, which rests on granite, and on and on. In like manner, modern Oklahoma rests on the dust bowl, which rests on the land runs, which rest on the cattle drives, which rest on the removals of Native Americans from their homes. One tragedy on top of another on top of another. But I don’t believe this is unique to Oklahoma. I believe it is the nature of things. So the text will come first in this post, attempting to explain what led to all these individual small mistakes, that led to bigger mistakes, that eventually led to tragedy. The photographs will follow and, if the text is worthy, may appear in surprisingly new contexts. Whether this is good structure will be left to the reader. First and foremost were the removals of Native Americans from their homes across North America to what later became Oklahoma Territory and the Nations (sometimes incorrectly referred to as Indian Territory). The Nations were home to the so-called five civilized Tribes: Chickasaw, Cherokee, Choctaw, Creek and Seminole. Each tribe was transferred its own separate “nation,” comprising hundreds of thousands of acres, to “make up” for the land it was deprived of by the federal government in the eastern United States. The most notorious removal involved the Cherokees and Chickasaws on the Trail of Tears, a forced march through the winter from the southeastern United States to the hills and mountains of eastern Oklahoma, during which thousands died. The Plains Indians of the western United States were hunted down, rounded up and placed in prisons, most infamously Geronimo of the Chiricahua Apache, who died in jail at Fort Sill, Oklahoma. Books have been written about this brutal stage of American history, notably And Still the Waters Run by Angie Debo. The removals color every aspect of life in this state. For example, after the Chickasaw relocated in what is now south central and southwestern Oklahoma, both state and federal law forbid them from their centuries old tradition of ceremonial dancing. When the Chickasaw were going to battle, they danced. When they were starting a long journey, they danced. When they were welcoming friends from another village, they danced. Dancing was in their blood and in their souls. It still is. The authorities, however, were determined to wipe out every last vestige of Native culture. Yet the Chickasaw endured. They held their dances after midnight when they knew the authorities would be in bed. For over 70 years they danced through the night until the laws were finally repealed. Now the Chickasaw dance daily at the Chickasaw Cultural Center in Sulphur, Oklahoma, and draw large crowds to celebrate their reemergence into the light of day. The memories run back generations. Several years ago, my wife and I attempted to locate the home of Quanah Parker, a mixed-blood Comanche who became quite wealthy by acting as an emissary between his tribe and the federal government. It turned out that the remains of his house – at one time almost palatial and the site of amazing ceremonial dinners with various dignitaries – was located in a locked parking lot behind a dilapidated restaurant on the outskirts of Lawton, Oklahoma. The restaurant owner, a bald man with a watermelon stomach, said he would unlock the gate after the luncheon “rush hour” had passed. When he said that, there were three people in the café. My wife and I decided to drive on. 7. Kickapoo -- May 23, 1895. The only run not disposing of Native American territory was the first, in 1889, which involved the so-called Unassigned Lands in what is now central Oklahoma which, through surveying errors, had not been assigned to any tribe. Oklahoma City is located there, as is my hometown of Edmond. Even this land was originally intended for Native Americans, so all of the runs, in one way or another, continued the 19thcentury pattern of driving Natives from their homes. Guthrie, however, is not located in the valley of the Cimarron River. Instead, it sits on the bluffs above Cottonwood Creek. Also, there were no wolves or coyotes anywhere near Guthrie. Another thing: it is true that the run was remarkable, but not in the sense envisioned by Harper’s. Native Americans viewed the land runs as desperate and dark, the climax of the mechanisms utilized by the federal government to divorce them from North America. Even worse, the new white settlements lacked law enforcement; Natives often were targeted by theft or other crime. Settlers stole their cattle and farm implements—even the wood from the Natives’ homes. But we now live in the twenty-first century, more than one hundred years after these events, and from my view, recriminations are not only pointless but counter-productive -- wasting your life arguing over the disputes of your great-grandparents. What’s done is done and will not be undone. But those who ignore the past do so at their own risk. As though God’s retribution for the 19thcentury crimes against Native Americans, the early 20thcentury in Oklahoma was plagued by years of drought and famine that came to be called the Dust Bowl. To a large measure, these conditions were caused, or at least exacerbated, by the land policies discussed above. To understand why, it is important to know where the dust bowl occurred and where it did not. The Dust Bowl occurred primarily in the High Plains of Oklahoma, Kansas, Colorado, Nebraska, New Mexico and Texas – with an emphasis on High Plains. Eastern and central Oklahoma were not part of the Dust Bowl. Neither were east or central Texas. The Dust Bowl roughly started at the 98thMeridian West and extended west to the Rocky Mountains. The High Plains are different from the lands to the east in three fundamental ways: They are (1) relatively flat, though sloping upwards from east to west, (2) mostly treeless, except along streams and rivers, and (3) semi-arid, generally receiving twenty inches or less of rain per year. These characteristics presented problems for the European settlers who, for over two centuries, had been learning how to farm the wet and humid regions of eastern North America and had been moving steadily westward, driving the Natives from their homes. When those settlers reached the High Plains in the 19thcentury, the world changed. Practically every institution brought from the East no longer worked. Wagons, weapons, plows and laws -- all had to be reinvented in this new landscape. In the East, life was supported by land, water and timber. In the High Plains, water and timber were scarce. So civilization based on all three collapsed. The Homestead Act was a classic example. This law gave settlers 160 acres to farm. Title vested after five years. In the east, 160 acres could sustain a family. Not so in the arid High Plains. In that country, 160 acres along a river or creek might be sufficient. Upland, however, 160 acres could sustain a few cattle, nothing more. Unirrigated farming was, and still is, out of the question. The Homestead Act of 1862 was followed by the Kinkaid Act of 1904, the Enlarged Homestead Act of 1909 and the Stock-Raising Homestead Act of 1916. The Kinkaid Act amended the Homestead Act so that one section (640 acres) of public land could be acquired free of charge, apart from a modest filing fee. It applied specifically to 37 counties in the Nebraska Sandhills. The Kinkaid Act produced a burst in economic activity that played out rapidly. Most Kinkaid homesteaders failed to raise crops, usually selling out to large ranchers. There were 377 farms in Holt County, Nebraska, in 1913. The following year, the number dropped to 144. The Enlarged Homestead Act applied throughout the West, not just the Sandhills, and doubled the allotted acreage from 160 to 320 acres. The Stock-Raising Homestead Act again increased the allotment, this time to 640 acres. The Homestead Acts were part of the "Free Soil" policy of Northerners who wanted individual citizens to own and operate farms, as opposed to Southerners who wanted to buy up large tracts and use slave labor. Land-grant laws similar to the Homestead Acts were proposed by Republicans before the Civil War but were repeatedly blocked by southern Democrats. Eventually, the Homestead Act of 1860 did pass Congress but was vetoed by democratic President James Buchanan. After Southern states seceded in 1861, the legislation passed again and was signed into law by President Abraham Lincoln on May 20, 1862. As amended in 1886, the Homestead Act explicitly allowed African Americans to participate. So there you have it – good intentions. Watch out for good intensions. Unfortunately, the Republicans did not know what they were doing, and the result was disaster. And here is another ingredient in the inedible soup. The 1920’s were abnormally wet. Residents of places like Tucumcari, New Mexico, and Guymon, Oklahoma, must have thought they had been transported to the Mississippi River, so often and so plentiful did the rains fall. If God had intended to lure people west to their doom, he could have done no better than to make the High Plains momentarily green. Prophets from other ages would have seen great punishment befalling unrepentant sinners, and although that thinking had not yet fallen from favor (as it has in our age, to our eventual sorrow), no one believed that he was going to fail. Failure was not in the late 19thcentury American vocabulary. The pioneers believed that theirs was a sacred duty to populate the West – Manifest Destiny! My great-grandfather and his family (including my grandfather) were among the unfortunates who migrated to eastern New Mexico to try their hand at dry-land farming. If you have ever traveled through that country, you know the immense folly of those poor souls. Drive U.S. Highway 54 northeast of Tucumcari today, and you will see mile after mile of arid country that struggles to support a few blades of short grass and half-dead cacti. The idea that one could grow dry-land winter wheat is preposterous. Unfortunately, rising wheat prices in the 1910s and 1920s and increased demand for wheat from Europe during World War I (the last ingredients of the inedible soup) encouraged farmers, including my relatives, to plow up millions of acres of native grassland to plant wheat. But as the United States entered the Great Depression, wheat prices plummeted. Farmers plowed even more grassland in an attempt to harvest a bumper crop and break even. None did. And when the rains stopped in 1931, all went broke. When the crops failed, the bare farmland lay exposed to the wind like skin that has been folded back to reveal a flexor tendon. The soil blew away – rapidly. As a boy, I listened as relatives of both my parents described how burgundy clouds would descend from the west like wraiths. Dust and sand would enter the house through any available crevice. When you ate, you felt the dust and sand in your mouth, likewise when you brushed your teeth. Even when you took a bath, you felt sand in the water. Dust made babies cry and gave even the strongest men horrible headaches lasting days. This was a man-made disaster without parallel, and it did not abate until the homesteaders abandoned the High Plains. Even today (2018), in winter when the weather is dry and the wind blows hard from the west, the air in western Oklahoma will fill with dust like smoke from a range fire, though nothing as sinister and monstrous as the old timers (now all dead) once described. But the memories live on in their descendants, which is why all residents of western Oklahoma constantly pray for rain --- even in wet years. I have attempted to discover the land in northeastern New Mexico upon which my forebears came to ruin. Unfortunately, my father’s family left no written record of their attempt at dry-land farming. My great grandfather died years before I was born, and my grandfather, while remembering that the farm had been somewhere northeast of Tucumcari, could never be more specific. All I can remember him saying is, “We couldn’t plant corn in the ground with a shotgun.” My father was born years later and knows nothing at all about it. I once spent a half-day in a vain search of the land records of Quay County, New Mexico. Tucumcari is the county seat and was founded in 1901, two years before the county. My search was conducted years before the internet and electronic word processing, when land records were stored in books the size of suitcases. Searching the land records then was as slow and tedious as moving the lawn with scissors. 9. The land records are complete but in error. Whatever, at age 67, I no longer desire to search. The truth will remain buried under the layers of dust that drove away the settlers. Of the events that shaped Oklahoma, the most romantic were the cattle drives. One thinks of tall, handsome, noble cowboys, all looking like Gary Cooper, riding red horses through red dust into red sunsets. One thinks that way because one is old enough to have seen the countless, bad “westerns” churned out by Hollywood in the 1940’s and 50’s. The truth, as always, is more somber. The cattle drives resulted from the same policies that drove Native Americans from their homes and opened the High Plains to subjugation that almost killed them. For about the first one hundred years of the Republic, Americans conceived of the High Plains as a wasteland, called them the Great American Desert and believed they were fit for habitation only by the savage Plains Indians, multiple tribes that followed the bison north and south each year, raiding and killing each other along the way. Most Americans had no idea of the vastness of the High Plains, of the sea of grass stretching from Texas to Canada, and of the almost limitless herds of bison that moved north and south with the seasons. Oh, Americans had heard of what they called buffalo (the correct name is bison), but they had no idea of the numbers. Those who saw the herds, however, never forgot. In 1839, Thomas Farnham, riding through southwestern Kansas, reported that it took his party three days to pass a single herd. In 1871, Colonel R.I. Dodge encountered a herd along the Arkansas River (with the emphasis on the second syllable, since he was also in Kansas) that he estimated to be 25 miles from east to west and 50 miles from north to south. Nineteenth century American literature is filled with descriptions of bison herds stretching across entire river valleys, a quivering brown mass like a single living entity cable of obliterating 30 feet tall river banks and anything else in the way. Disasters are an accumulation of small, insignificant events that, when combined, evolve into something greater than the sum of the parts. And since this is a railroad blog, what could be more relevant than to realize that the demise of both the bison and the Plains Indians was a direct result of the railroad. As the Union Pacific pushed west across Nebraska, small ranchers followed with cattle to feed the workers. And here is another link in the chain that led to the dust bowl: most people prefer meat from cattle to meat from bison. I include myself in that large group. Bison meat, even from farm-raised bison fed nothing but corn, is tough and stringy compared to corn-fed beef. The poor bison never stood a chance. The early cattlemen assembled herds outside of Denver to service the railroad and began to believe that domestic cattle could withstand the High Plains’ harsh winters and lack of water. If so, there was big money waiting on the open range. One of the first big western ranchers was John Wesley Iliff, who made so much from selling beef to the Union Pacific that he purchased over 100 miles of prime river-bottom land across the South Platte River in Colorado. His holdings were so vast that he could ride for a week across his ranch and sleep only in his own bunkhouses. What followed was the greatest massacre in human history. Because the bison herds were so vast, I doubt that anyone actually conceived of displacing them. Everyone likely assumed that the bison would roam the plains forever. Yet in one of the most organic executions ever carried out, bison were driven to the edge of extinction in less than 20 years and completely replaced by cattle. Think about that. Good whiskey ages longer than 20 years. Every state in the Union believes that someone 20 years old is not reliable enough to consume that whiskey. I practiced law for more than 20 years before I felt semi-competent in a courtroom. Yet in that short span, millions of bison were reduced to less than 500 south of Canada. Railroads facilitated the slaughter. The building of the Union Pacific effectively divided the great bison herds in half, and the southern group disappeared in 1875. The northern herd lasted longer, but it, too, was gone by 1883. Special trains were arranged for hunting parties, with participants shooting animals from the open windows of railroad cars. Wounded and slain bison were left alone to die and rot. The railroads encouraged the slaughter as a method of keeping the animals away from the tracks and rolling stock. Another small detail in the cascade leading to disaster was the discovery that strips of bison hide sewn together made excellent belts for driving 19thcentury factory machinery. Suddenly, the idea of leaving the animals to rot on the High Plains was financial madness. Follow the money. Overnight, bison hunting became big business. Some hunters worked alone, quietly approaching a herd on foot. Bison are inquisitive and not easily frightened. Often, a single hunter could walk into a herd and kill eight to ten animals before the it occurred to the others that it might be a good idea to flee. A second form of bison slaughter involved men on horseback, who would charge the herd to scatter it, then shoot the slowest animals one-by-one. In this manner, large hunting parties could kill over 1,000 bison per day. Even solitary hunters could kill almost one hundred per day. “Buffalo Bill” Cody claimed to have shot more than 20,000 animals in his career. And here is where one tragedy leads to another, which leads to another, until the circle is completed. The U.S. Army encouraged the killing of bison to deprive the Plains Indians of their food source and way of life, thus making them totally dependent on the federal government for support. Whether this plan was conscious is debatable, but there is no question that the military gave ammunition to private hunters, encouraged its soldiers to hunt bison for sport and threw lavish hunting parties for important politicians and industrialists. Native Americans, of course, understood exactly the government’s intent. Ten Bears of the Yamparika Comanche said, “So why do you ask us to leave the rivers and the sun and the wind and live in houses?” But the federal government did require the Plains Indians to leave their migratory ways, which they had pursued for centuries, and “live in houses.” Once both the bison and the Natives had been removed from the High Plains, the stage was set for the cattle drives. The cattle were almost exclusively longhorns from Texas, a state badly damaged in the civil war. In 1870, the largest city in the state was Galveston, with a population of less than 10,000. Cattle ranches were small, the ranchers poor. At the same time, cities in the North were booming, and the residents developed a taste for beef. But how could you get cattle from Texas to the North, when there were no railroads and few passable trails across the Indian country that later became Oklahoma? The Texas Longhorn was a cross between a brand of southern cattle and wild black cattle introduced to North America by Spaniards. With spindly legs and thick torsos, these animals were known for their enormous horns that looked like bicycle handlebars. They spent the daytime in the brush, usually coming out only at night to eat. The bulls were solitary and vicious. Cows would defend their calves to the death. But the longhorns thrived in semi-arid lands and could go for days without water, making them well-suited for drives north. The sources I have consulted indicate that at least eight men were needed to drive a thousand head of cattle, and that each man needed at least five horses. The trail boss would ride ahead, looking for water and open pasture for the cattle to graze. The cook followed with the chuck wagon. Behind the food came the horses – called the remuda. Then came at least two cowboys at the front of the herd, with at least two more on each flank. The youngest drovers brought up the rear and forced the slow and lame cattle to keep moving, all the while dodging the copious quantities of manure that a thousand or more longhorns could produce. 3Ist. Swimming Cattle is the order We worked all day in the River & at dusk got the last Beefe over—and am now out of 'I'exas—This day will long be remembered by me—There was one of our party Drowned today (Mr. Carr) & Several narrow escapes & I among the no. June1. Stampede last night among 6 droves & a general mix up and loss of Beeves. Hunt Cattle again Men all tired & want to leave, am in the Indian country am annoyed by them believe they scare the Cattle to get pay to re-collect them—Spent the day in separating Beeves and Hunting—Two men & Bunch Beeves lost—Many Men in trouble. Horses all give out and men refused to do anything. 2nd. Hard rain & wind Storm Beeves ran & had to be on Horseback all night Awful night. wet all night clear bright morning. Men still lost quit the Beeves & go to Hunting Men Is the word Found our men with Indian guide and 195 Beeves 14 Miles from camp. Duffield was one member of a small partnership formed in Iowa to purchase longhorns in Texas and drive them back to near Des Moines, where some of the cattle would be resold at a profit (the going rate was about $8.00 per head in Texas and almost twice that much in Iowa), and the rest would be used to improve the stock on the farm of one of the partners. The partners went to Texas via New Orleans and Galveston, and the middle of March, I866, found them near the Colorado River west of Austin, where they purchased 1,000 head of cattle, which were quickly branded. Because a considerable part of the drive was through Indian country, and because the tribes were generally hostile, the herds of many outfits were combined so that at the beginning of the drive, over five thousand head were involved. The drive to Iowa started May 1, 1866, and ended the last day of October – exactly one-half year. A few hundred cattle remained. 100 were shipped by rail to Burlington for the farm of one of the partners, and the remainder were sold to the slaughterhouses in Chicago. None of the partners ever again participated in a cattle drive. As nearly as I can tell, most cattle drives were organized by a few entrepreneurs looking to make a quick fortune. These men were the equivalent of “day traders” in the stock market, willing to invest their capital on a scheme that sounded romantic and might make them rich. Unfortunately, the drives were not romantic, and no one got rich. The first herd to follow the future Chisholm Trail belonged to O. W. Wheeler and his partners, who in 1867 bought 2,400 steers in San Antonio. They planned to winter them on the plains, then drive them on to California. At the North Canadian River near the present town of El Reno, Oklahoma, they saw wagon tracks and followed them. 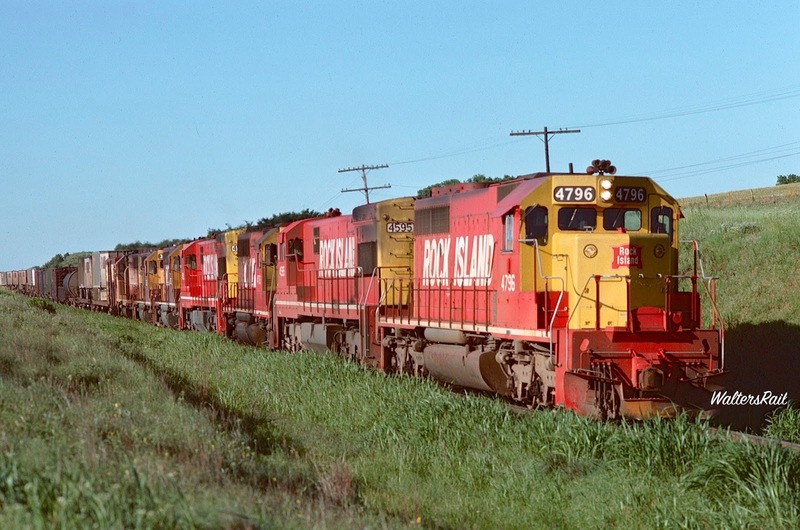 The tracks were made by Jesse Chisholm, a Scot-Cherokee who since 1864 had been hauling goods to Plains Indians south of his post near modern Wichita. Though the name Chisholm Trail originally applied only to the route north of the Red River, Texans, as is their wont, soon gave Chisholm's name to the entire trail from the Rio Grande to central Kansas. The cattle did not follow a clearly defined route except at river crossings; it was necessary to spread them out to find grass. The animals were allowed to graze along for ten or twelve miles a day. A trail boss, 8-10 cowboys, a cook, and a horse wrangler could drive 1000 cattle to the railheads in Kansas for sixty to seventy-five cents a head. 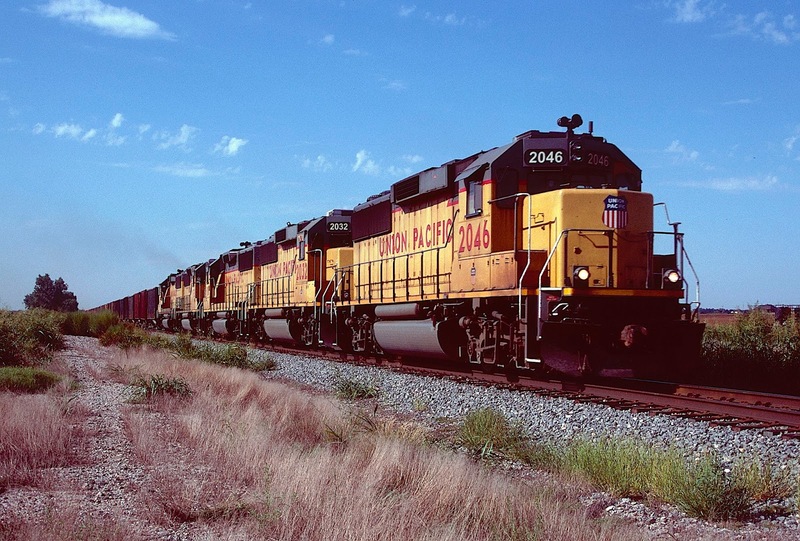 From 1867 to 1871, more than three million cattle were driven up the Chisholm Trail from Texas to Abilene, Kansas, the location of a major shipping terminal on the Kansas and Pacific Railroad. 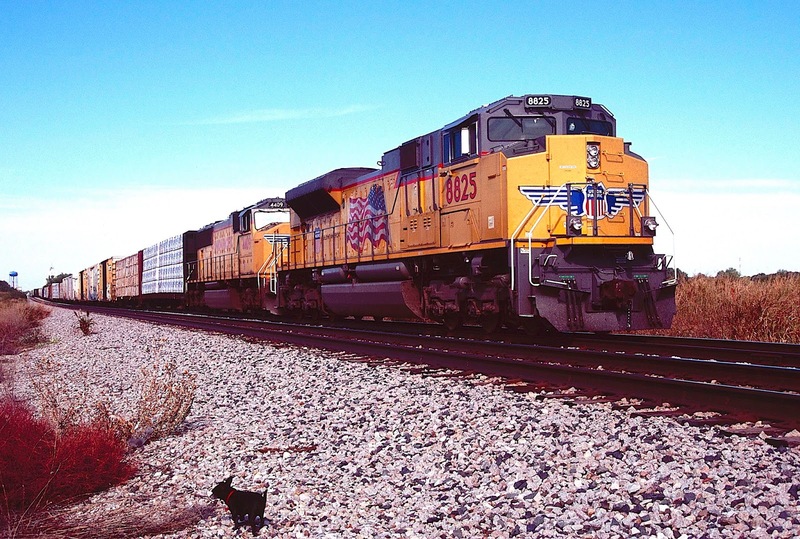 In that latter year, the Santa Fe completed construction of its original transcontinental mainline as far as Newton, Kansas, which then became the new railhead, shortening the drive from Texas by about 70 miles and 6-7 days. Newton’s reign lasted one year. Then Wichita approved the issuance of a $200,000 bond to construct a line from Newton to Wichita, shortening the cattle drives by another 30 miles and 2-3 days. Wichita then became the new terminus for Longhorns, and the cattle business thrived. In 1880, a predecessor of the Rock Island completed construction of a line south from Wichita to Caldwell, which sits about two miles north of present day Oklahoma. Caldwell, Kansas, became the final northern terminus for the Chisholm trail, which ceased activity in 1884 because of a Kansas quarantine on Texas cattle, and barbed-wire fences’ springing up in the soon-to-be Oklahoma Territory. What became the Rock Island roughly followed the route of the Chisholm trail south from Caldwell to the Red River. Today, U.S. Highway 81 follows that same path. The images in this post start just south of Caldwell and proceed south to Chickasha, Oklahoma, in the old Chickasaw Nation – the southern terminus of what is now UP’s Enid Subdivision. Included are images of both railroads, taken over about 45 years, as well as a map showing the area surveyed. This discussion of at least some of the history underlying this rather short segment of railroad (about 170 miles) illustrates, I hope, the layer upon layer of tragedy supporting the roadbed. Today the land looks serene, but it was not always so. In fact, it is not serene today. Nothing is ever serene. Serenity is a construct to keep us sane. Scratch below the surface, any surface, and you will find the beginning of one small mistake leading to another, and another, until you eventually get tragedy. Such is life in these United States – or anywhere else, for that matter. US 81 follows the old Chisholm Trail and UP's Enid Subdivision from Caldwell, Kansas, to Chickasha, Oklahoma. 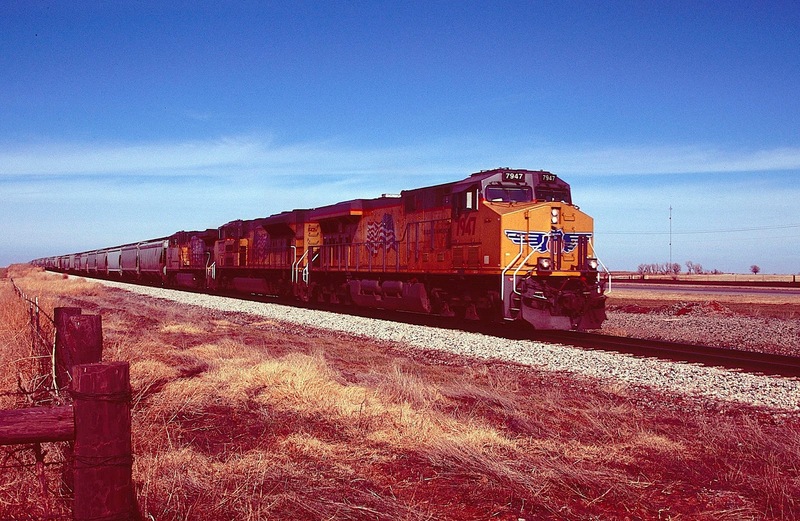 A northbound UP manifest prepares to cross the border into Kansas -- January 2011. 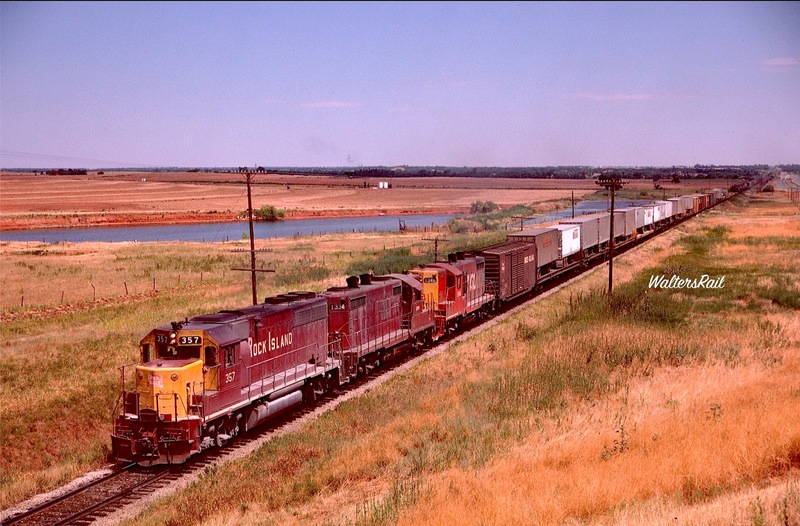 Northbound Rock Island manifest is approaching Medford, Oklahoma -- July 1974. 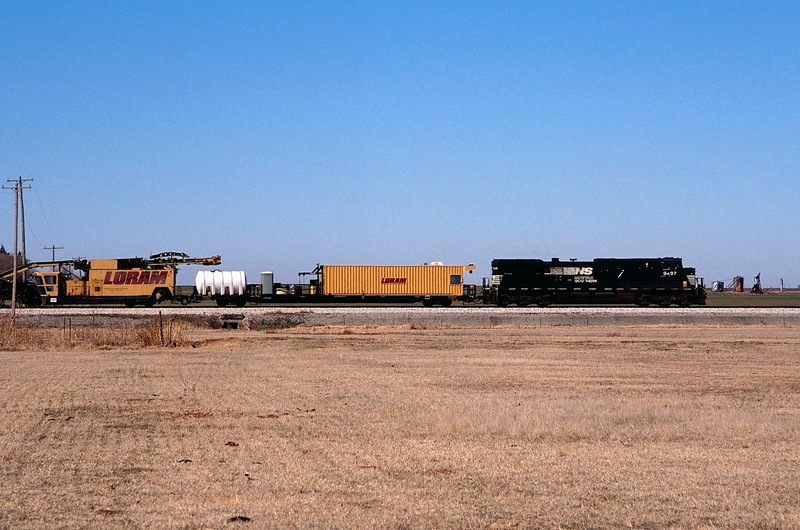 This southbound Rock Island manifest is rolling north of Jefferson, Oklahoma -- February 1974. 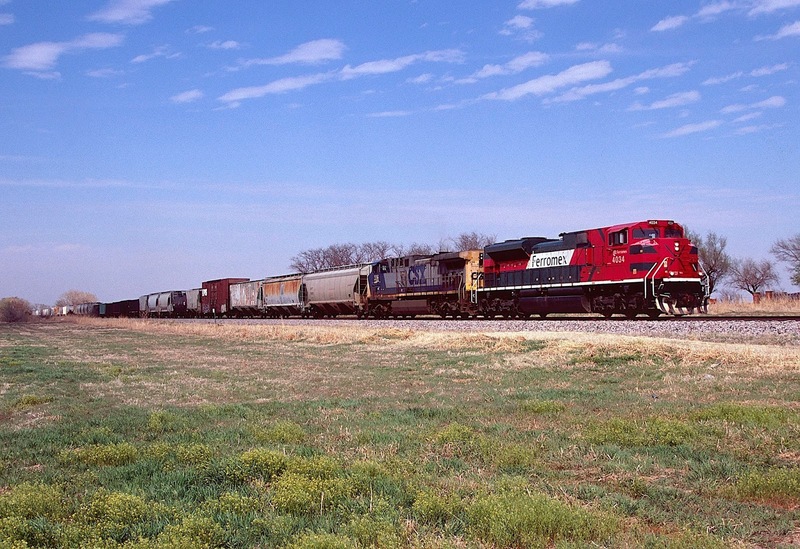 A southbound UP rock train rolls toward Pond Creek, Oklahoma -- June 2009. 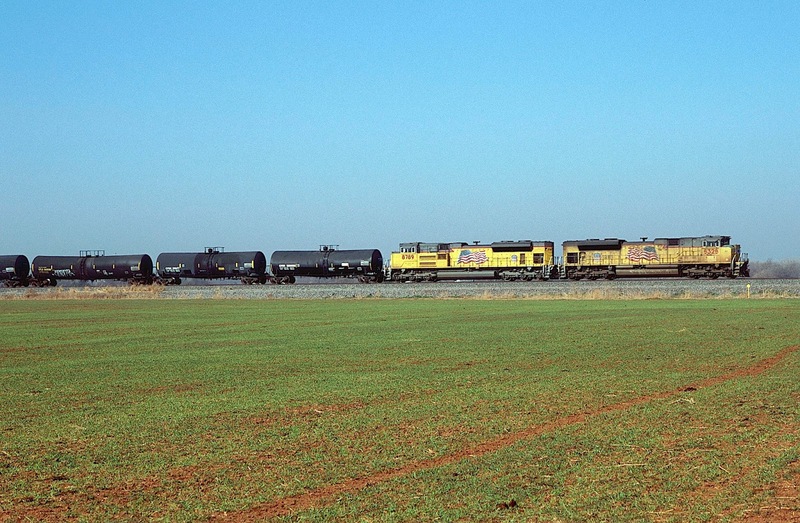 A northbound manifest, with empty tank cars behind the motive power, rolls beside dormant winter wheat north of Enid, Oklahoma -- January 2011. A northbound manifest leaving Enid, Oklahoma -- August 1976. 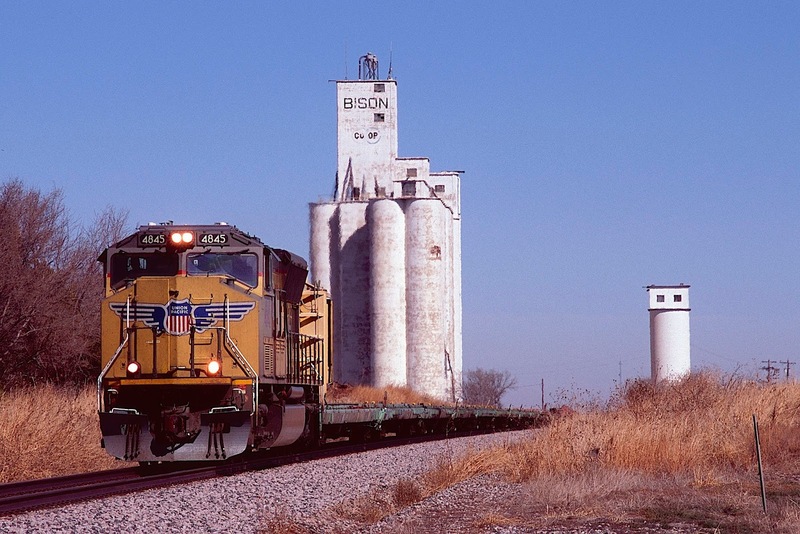 A southbound UP bare table, with one load, rolls past the grain elevators at Bison, Oklahoma -- February 2009. This is the oddest movement I've ever seen on the old CRI&P north-south mainline through Oklahoma. 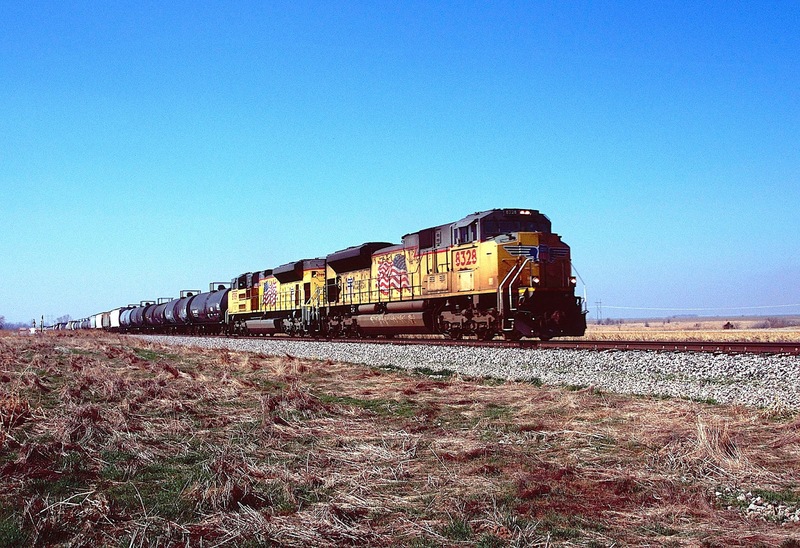 Norfolk Southern power is pulling a Loram maintenance train near Hennessy, Oklahoma -- January 2010. Here is another interesting movement north of Hennessey, Oklahoma in the winter of 2008. 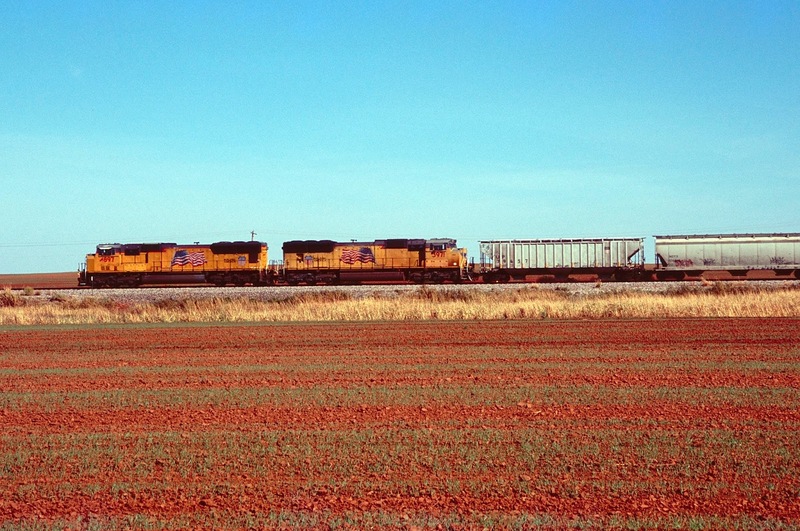 A southbound potash train is approaching Hennessey, Oklahoma -- January 2006. 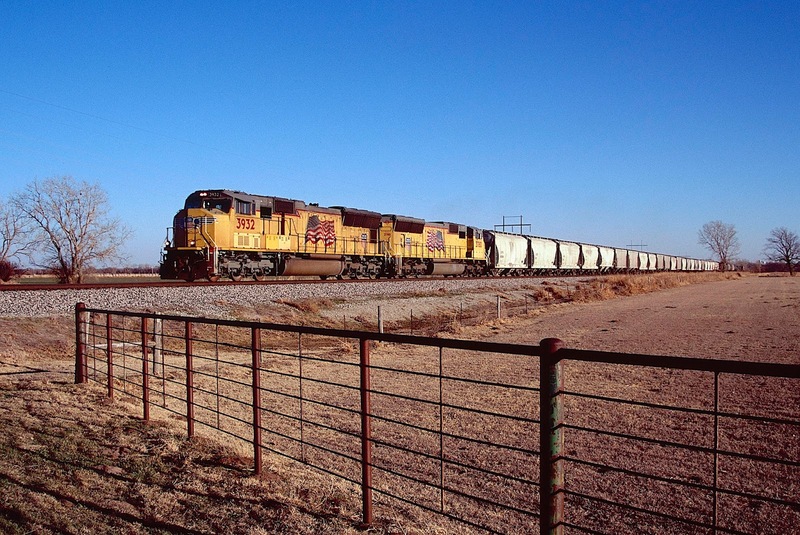 A Union Pacific rock train is heading south of Dover, Oklahoma, toward the Cimarron River -- September 2009. 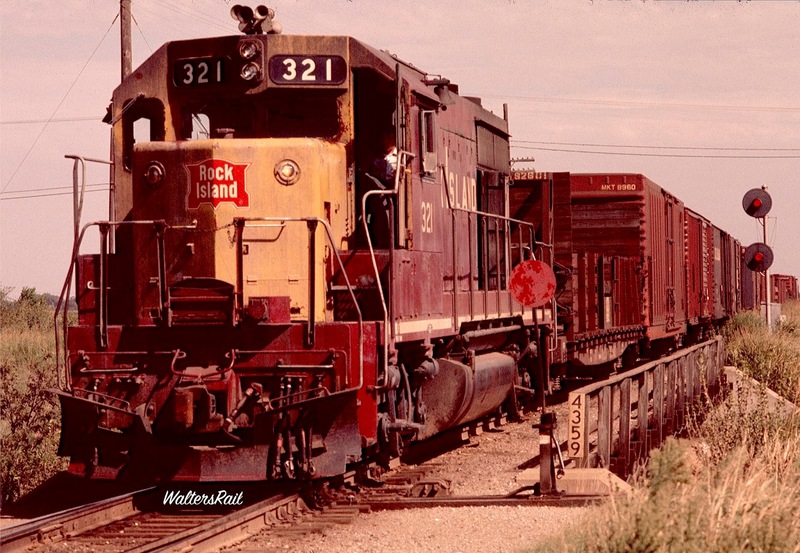 A southbound CRI&P mixed freight has just crossed the Cimarron River -- June 1972. 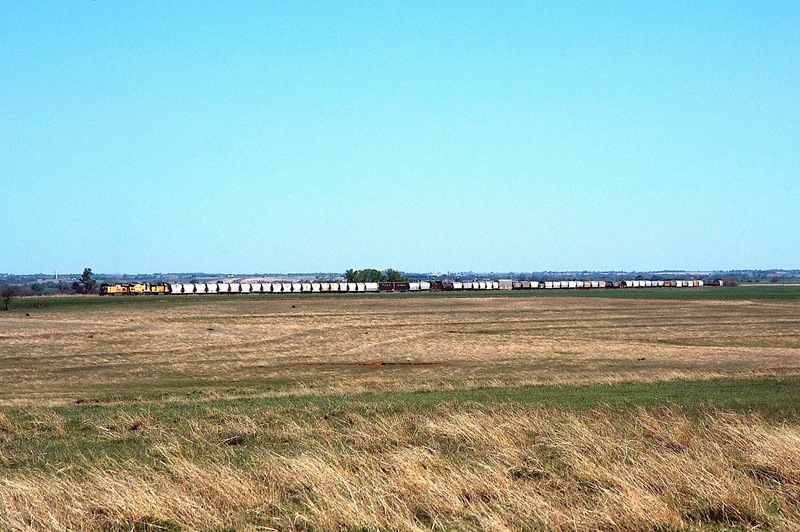 Here is a southbound UP oil train at the same location in 2010. 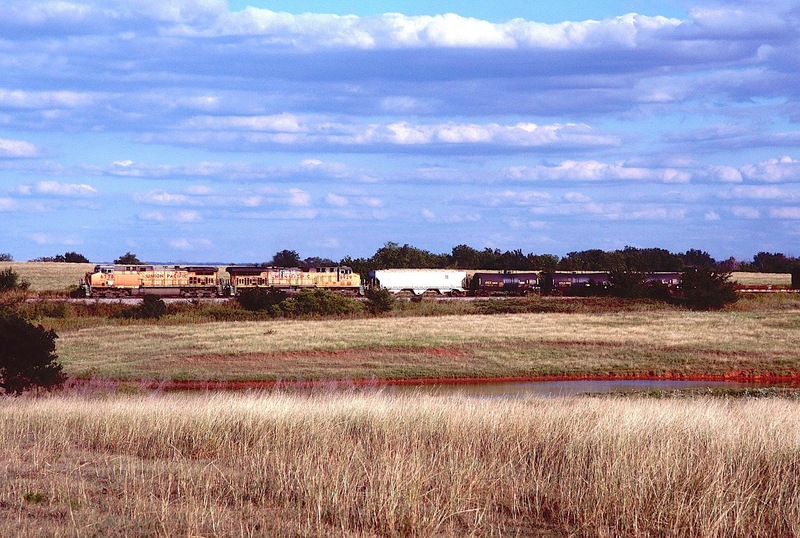 A southbound manifest waits on the siding at Kingfisher, Oklahoma. In the foreground is Bear the Mighty Dog. Another southbound waits on the Kingfisher passing siding. 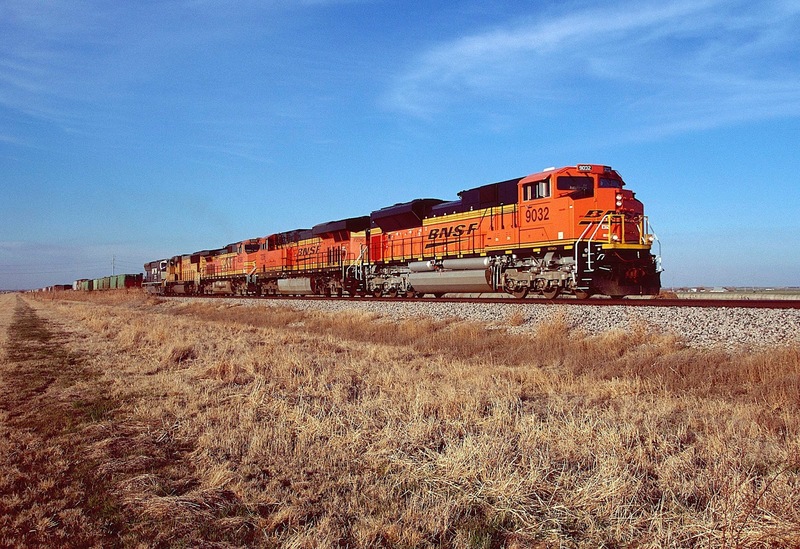 This looks like a BNSF manifest on the Red Rock Subdivision, but the train is actually rolling down UP's Enid Subdivision near Okarche, Oklahoma. 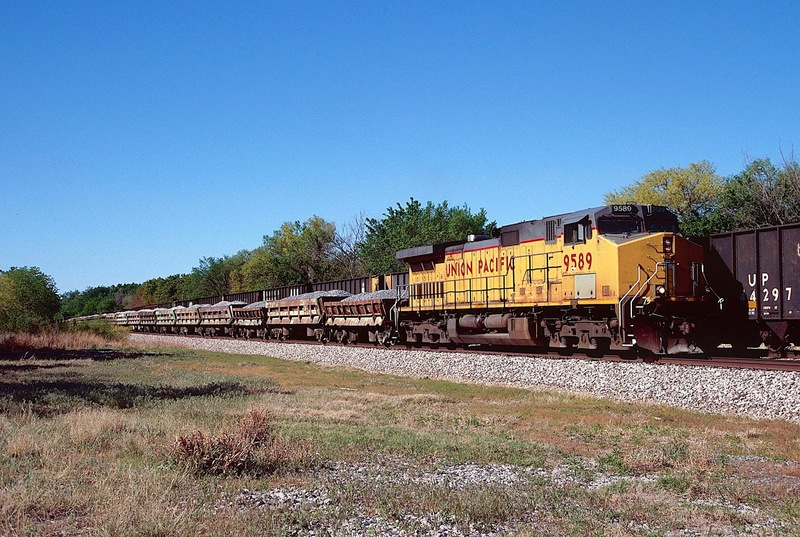 A southbound coal load approaches Okarche, Oklahoma. 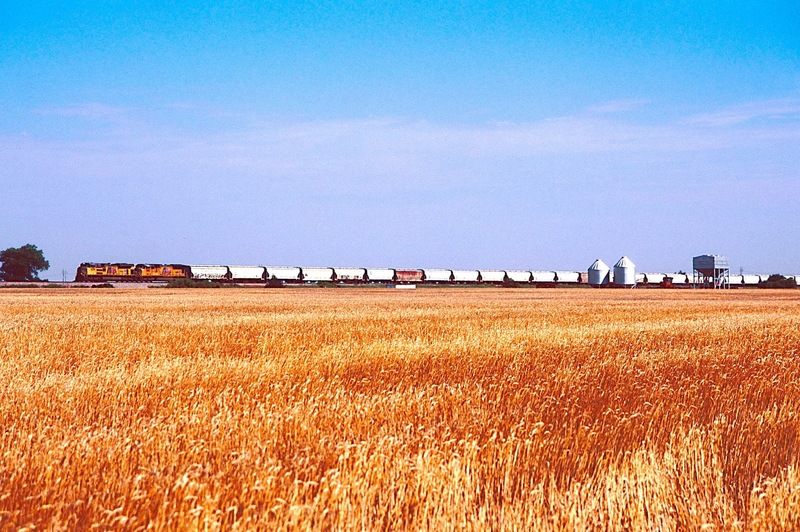 A northbound train carrying fracking sand has just come off Concho Hill and is passing adolescent winter wheat. 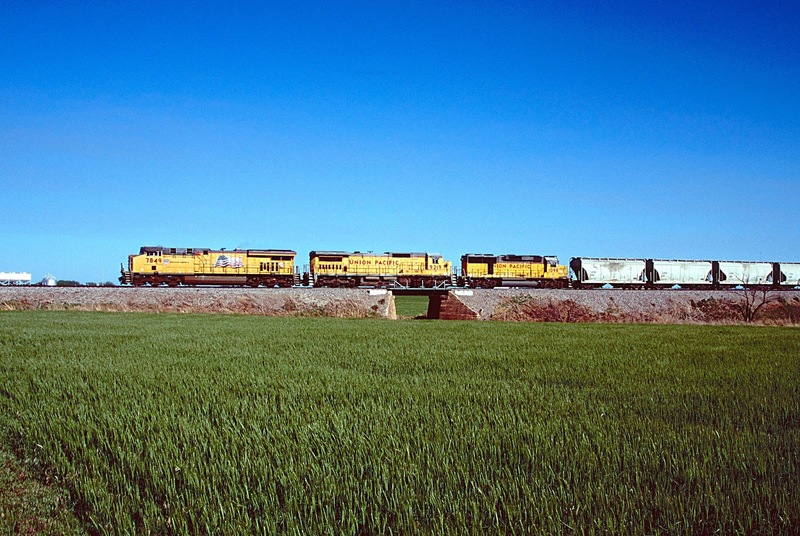 A southbound UP potash train is approaching Concho Hill beside ripe winter wheat. A northbound mixed freight has passed Concho Hill and is rolling toward Okarche. CRI&P 1286 backs into a stub track on Concho Hill to pick up a single car -- April 1976. 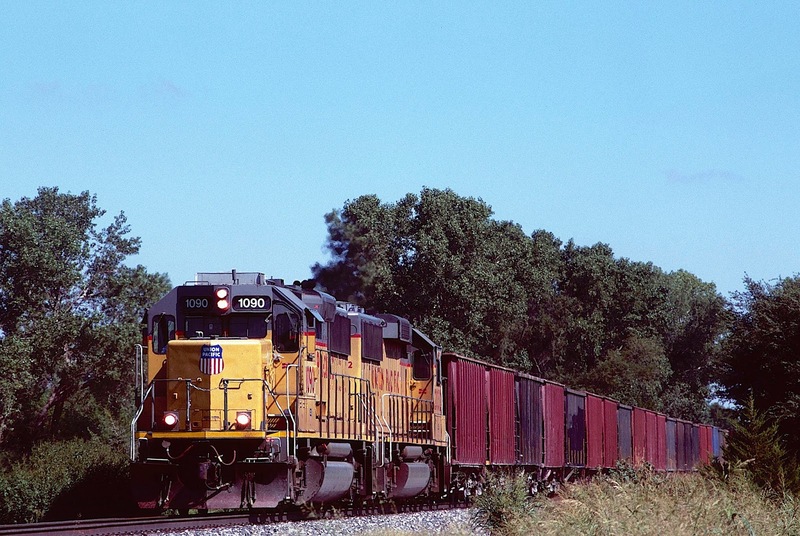 A southbound coal train is passing a UP ballast train in the siding at Concho Hill. UP 3932 is rolling north of El Reno, Oklahoma, and approaching Concho Hill at the top of the climb out of the valley of the North Canadian River. 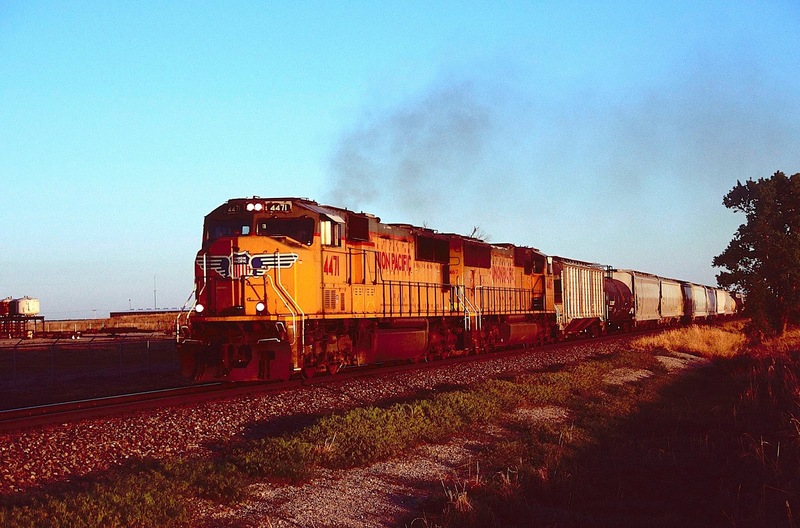 A southbound freight is leaving the yard in El Reno, Oklahoma -- 1975. The train is moving compass east and will soon turn south to join the mainline, which runs along the west edge of the yard in the background. 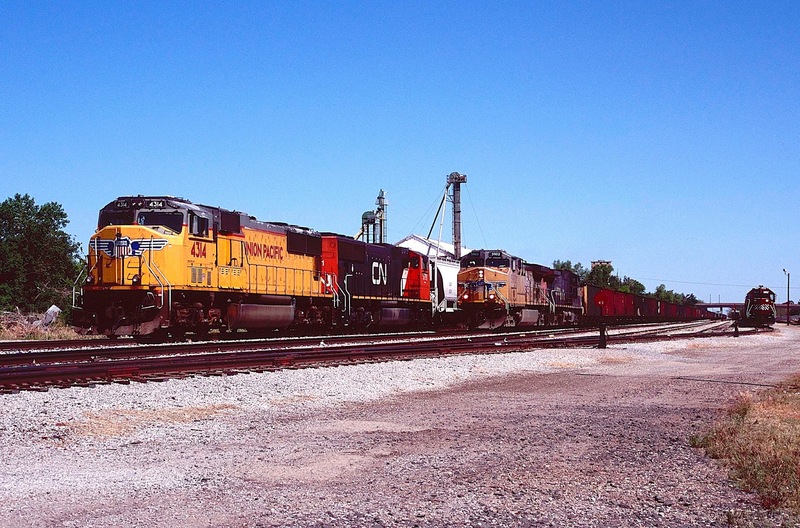 An EMD SW1200 in the yard at El Reno, Oklahoma. 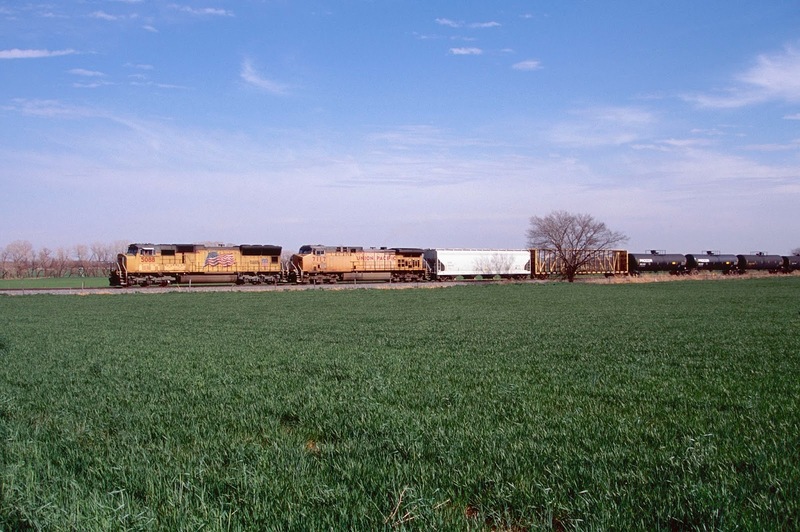 A loaded CRI&P southbound grain train has departed El Reno and is heading to Chickasha, Oklahoma. 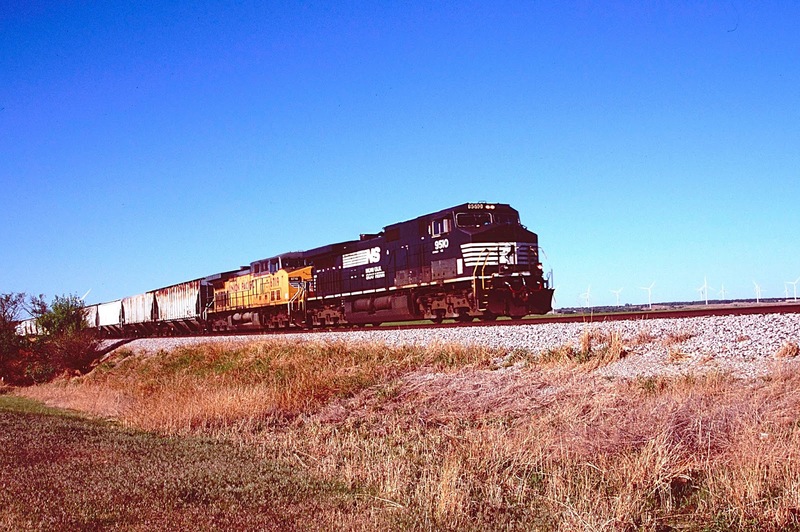 A northbound UP mixed freight is approaching El Reno, Oklahoma -- September 2013. Rock Island manifest rolls beneath the I-40 overpass south of El Reno. A southbound UP manifest (with NS power on the point) is climbing Minco Hill, with electric-utility windmills in the background. A northbound manifest is climbing Minco Hill. A northbound mixed freight approaches Minco Hill. 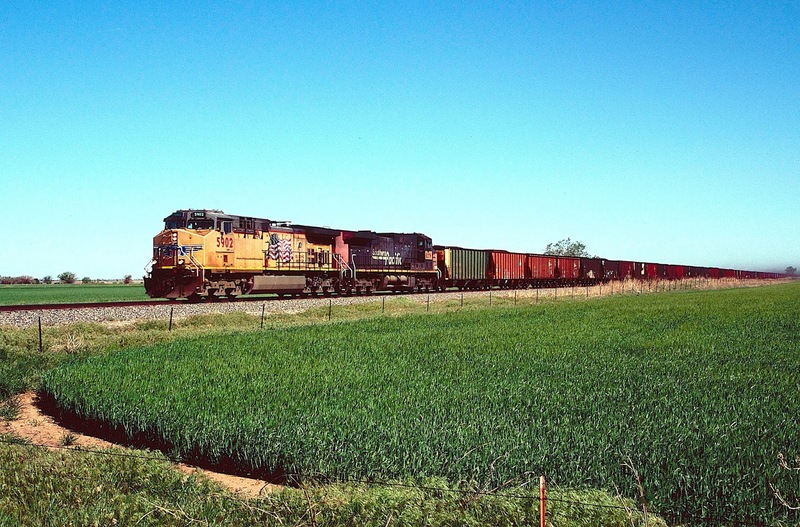 A northbound manifest has departed Chickasha, Oklahoma, and is rolling at track speed beside the red soil of west central Oklahoma. A southbound manifest is just north of Chickasha beside dormant winter wheat (waiting for the spring to start growing again). 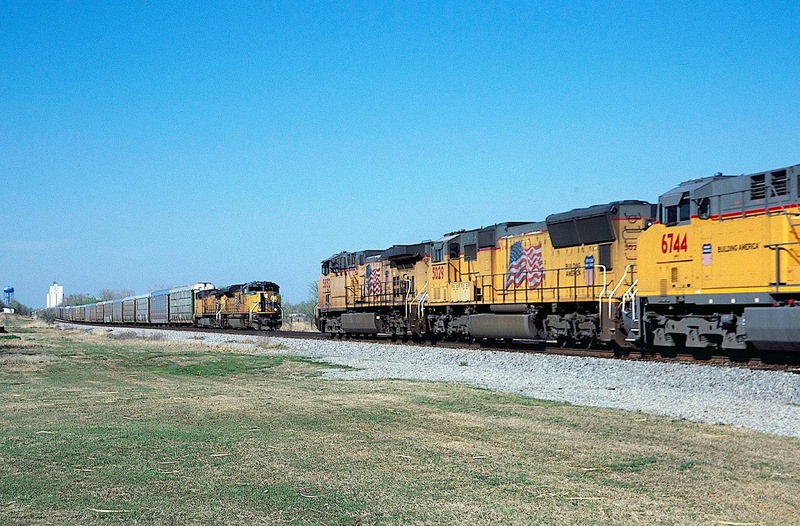 A southbound CRI&P local pulls into the yard at Chickasha, Oklahoma. 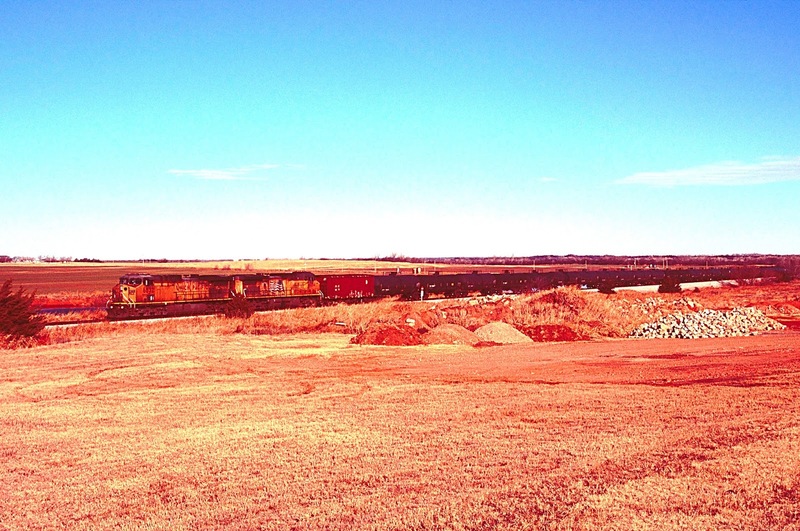 A southbound coal load pulls through the yard in Chickasha -- the end of UP's Enid Subdivision and of this post. I was the conductor on the BNSF looking train you took a picture of near Okarche. I don't know you but I saw you. I made sure not to hang out the window and wave so I didn't ruin your picture. It was me and my engineer Joe Steffanatos out dog catching that Saturday afternoon. We were quite popular that day, no less the 3 different railfans out photographing us that day. We picked up the train in the downtown Enid siding and took it home. It was a good day, we got one train and were on duty just less than 8 hours.